Somewhere between a skateboard and skates. They are not connected to the skaters feet but are similar to skateboards except there is one for each foot. I'd end up at the emergency room if I tried that. Omigosh - my nephew would love those! His last fascination were those "heeler" shoes with a roller in the heels. I would also end up in the ER if I tried them. In SA there is a craze - a la Dog Whisperer - to go roller blading with your dogs, so they should market these in pet shops too. 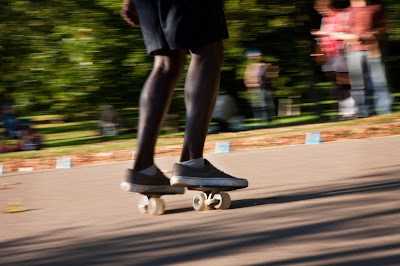 I used to skateboard when young I now roller-blade. Saw those the other day and was intrigued. I'd kill myself with those. No way. I'd probably break both legs. A fast and easy way for me to break a leg! Very scary indeed! Great pic. I think I will stick to the roller blades...it looks like too much effort for my liking!